Unihertz -a China company- has launched a new smartphone called Jelly. The phone is said to be the smallest smartphone that has 2.4 inches screen size, runs on Android 7 Nougat, and also 4G LTE enabled. The phone measures at 92.3 x 43 x 13.3 mm. It is meant to be an alternative to your bigger smartphone. Jelly sports a 2.45-inch screen with 240 x 432 pixels, and, compared to most handsets currently on the market, it looks like a toy. And yet it's a fully fledged smartphone that runs Android 7.0 Nougat and has support for 4G LTE. Jelly is powered by a quad-core 1.1 GHz processor, and comes in two variants: one with 1 GB of RAM and 8 GB of internal memory, and a Pro variant with 2 GB of RAM and 16 GB of storage space. Both models feature two cameras (8 MP on the back, 2 MP on the front), dual SIM support, GPS, Wi-Fi, Bluetooth 4.0, and a 950 mAh battery. 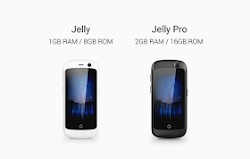 The best thing about Jelly isn’t its specs — it’s the price. The early-bird pricing for the device through the Kickstarter campaign is $59 for the base model and $75 for the Pro, which makes it one of the cheapest ways to get the latest and greatest version of Android. You can buy Jelly on Kickstarter Here. Unihertz Jelly phone specifications. Where to buy Unihertz Jelly smartphone. Unihertz Jelly price in China, USA, India, Nigeria.